General Description of Blood Group Antigen B. 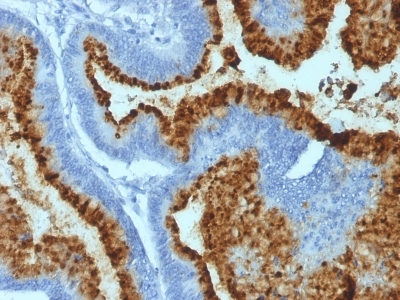 The antibody HEB-20 reacts with human blood group B. The specificity of the antibody HEB-20 was confirmed by comparison of specificity, reactivity to standard reagent using >5.000 samples of blood. The MAb HEB-20 shows specific staining of erythrocytes, vascular epithelium of blood group B controls, no staining in group A controls. This MAb is applicable for tissue staining in tumor patients with blood groups B, AB. Blood group antigens are generally defined as molecules formed by sequential addition of saccharides to the carbohydrate side chains of lipids, proteins detected on erythrocytes, certain epithelial cells. The A, B, H antigens are reported to undergo modulation during malignant cellular transformation. Blood group related antigens represent a group of carbohydrate determinants carried on both glycolipids, glycoproteins. They are usually mucin type,, are detected on erythrocytes, certain epithelial cells,, in secretions of certain individuals. Sixteen genetically, biosynthetically distinct but inter related specificities belong to this group of antigens, including A, B, H, Lewis A, Lewis B, Lewis X, Lewis Y,, precursor type 1 chain antigens. Tested Applications: Agglutination, Immunofluorescence, Immunohistochemistry (IHC). Anti-Human Blood Group Antigen B Positive Control Sample: KG1 cells or human colorectal carcinoma tissues. enQuire Bio's Blood Group Antigen B Anti-Human Monoclonal is available for Research Use Only. This antibody is guaranteed to work for a period of two years when properly stored.